The assessment should take between 25-35 minutes to complete. We recommend taking the entire assessment at one time. Most results are available online within 24 hours. In the event that your report does not appear after that time, please contact us using the email link provided below to determine whether your results required additional review by APTUS prior to release. There is no "pause button" once you begin the assessment. The assessment will time out if you do not touch the iPad for a full 10 minutes. You will be taken back to the login screen, where you will be asked to enter your username and password again, and you will then begin with the exercise on which you were previously working. There is not a way to retake specific exercises. It is important to remember that one does not pass or fail an APTUS discovery assessment; instead, it is a tool to provide objective feedback on how you define, process and execute instructions and information across various contextual environments. Depending on who purchased the assessment, your parent/employer/coach may be able to view your individual reports or group-level reports of which you may be a part. Your fingers will work in place of a stylus. However, we have noticed that some people with larger hands prefer using a stylus for comfort reasons. Please contact APTUS directly at customerservice@aptusdiscovery.com if you have any questions about your results. Due to the memory-intensive nature of the app, iPads with lower levels of installed memory might experience performance problems. In order to ensure that the maximum amount of memory is available, please try restarting your iPad before you begin an assessment. If the app stops working, you can double-tap the Home button on your iPad to launch the task switcher. From there, scroll to any running instances of the app and swipe up or down to terminate that process. You can then try restarting the app. Please make sure your Adobe Acrobat Reader software is up to date, as certain elements of the report depend on the latest Acrobat features in order to display properly. You can download the most recent version of Acrobat Reader from Adobe's website here. 1. Power on the iPad and double-tap the Home button. This should launch the task manager/switcher. 2. Scroll over to any instances of the APTUS Discovery app and swipe up/down to shut down the task. 3. Make sure the iPad is connected to WiFi. 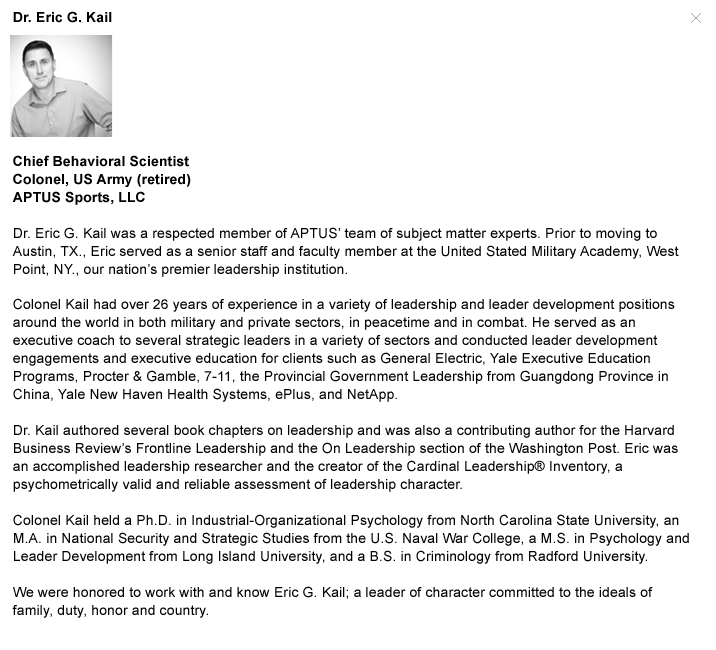 Dr. Eric G. Kail was a respected member of Team APTUS. We were honored to work with and know Eric, a leader of character committed to family, duty, honor and country.